After Modus Vivendi (2003) - the last album to feature current SERIOUS BLACK vocalist Urban Breed - Sweden's TAD MOROSE went 10 years without a studio release. They gigged sporadically during this time with American vocalist Joe Comeau (ex-ANNIHILATOR) but didn't come storming back until joining forces with their current front man Ronnie Hemlin (ex-STEEL ATTACK). Since then, they have been on a winning run with Revenant (2013), St. Demonius (2015) and this year's Chapter X. 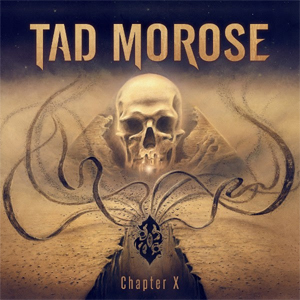 For the uninitiated, TAD MOROSE's music can be described as a power/classic heavy metal hybrid with slight progressive tendencies. Chapter X (referencing their tenth official studio recording) is another strong effort in this vein and on par with their last two offerings in terms of writing and production (which, by the way, is immaculate and was largely handled by the band). In brief, this means well-crafted songs with Ronnie Hemlin's powerful vocals (his tone and approach are very distinctive and individual - but not without precedent) completing the tracks provided by founding member Christer "Krunt" Andersson (guitars); Kenneth Jonsson (guitars); Johan Löfgren (bass); and Peter Morén (drums). All of the members acquit themselves nicely throughout, with excellent musicianship and ample fleet and melodic guitar work. The range of the material found on Chapter X is encapsulated in TAD MOROSE's latest promotional vehicles. The lyric video for "Apocalypse" touches on all of the previously mentioned elements: a progressive arrangement with crunchy guitars; symphonic flourishes in the middle section; and guttural/death vocals tucked into the background of the chorus. The "heavy vocals" are not really needed here and elsewhere that they are applied, but it is a specific creative choice - and thankfully not overused. The music video for "I Am Night" (video on KNAC.COM HERE) reflects their straight-ahead metal side (they often bring to mind a darker version of ACCEPT) complete with plenty of double-bass drumming, aggressive guitar riffs and screaming vocals - in a compact song format that gets right to the point. Two additional concise compositions in this vein are "Turn to Dusk" and "Nemesis". This is TAD MOROSE'S core style and represents the overall direction of the disc - experimental and progressive moments aside. Additional twists and turns include an occasional foray into doom metal territory similar to countrymen SORCERER (check "Leviathan Rise"). Cutting to the chase, Chapter X is 14 tracks of dark, power/classic heavy metal with a slight progressive flair that doesn't get boring or monotonous - and that is no mean feat. Fans of the genre or any of TAD MOROSE's catalog can't go wrong with this release.